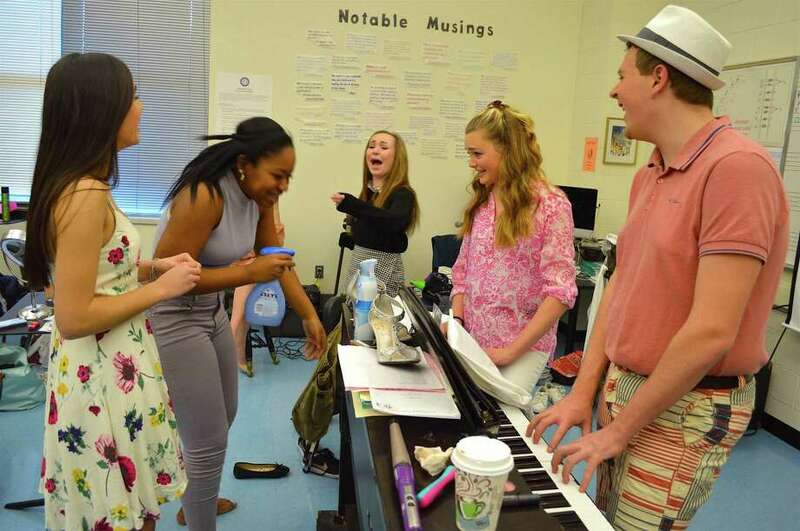 Some cast members share a notable moment of amusement before the Darien High School's Theatre 308 performance of "Legally Blonde," Thursday, Mar. 23, 2017, in Darien, Conn.
“In the past Darien has done very classic shows and this is the first year in a long time that we’re tackling a contemporary title,” explained teacher Rebecca Brendli, who directed the show, which held sold-out performances Thursday, Friday and Saturday. “And what’s great about this is it’s entirely student-run—the cast, the pit and the crew are all kids from Darien High School,” she said. Theatre 308 is a collaborative effort between Darien High School students and faculty to produce two main stage theatrical performances each year and several student-directed one-act plays in the spring.